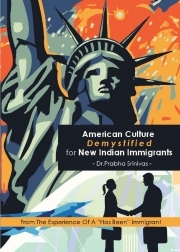 Description of "American Culture Demystified for New Indian Immigrants (eBook)"
This book is based on the author's experiences when she relocated to the USA in 2000. There were not many resources for Indians then neither was cross cultural training offered. Indians who are relocating to the USA will be able to gain an insight into the culture and traditions of that country by reading this book. They will be able to anticipate some of the daily living requirements and plan their relocation better. The book is based purely the author's observations and conclusions which have been tempered with her knowledge and experience as a cultural competence trainer. Dr. Prabha Srinivas is an independent Organization Development consultant currently lives in Bangalore. She has designed, developed and delivered successful programs in areas such as cultural competence, leadership development through Emotional intelligence, mentoring, change management, problem solving techniques and assertiveness skills. In the last few years, she has coached several C level executives at the time of their relocation to India . Dr. Srinivas has lived in the United States for several year where she has worked as a Learning and OD consultant at the Metropolitan Council, Minnesota and as Faculty at the Minnesota School of Business teaching undergraduate and graduate courses in the areas of Human Resources Management and Supervisory Management. Reviews of "American Culture Demystified for New Indian Immigrants (eBook)"